DocuApps is a new series of Apps for mobile platforms. Each DocuApps provides the full text of books, laws and important legal documents. DocuApps allows users to research using Wikipedia and popular search engine tools from directly inside the document, right at the point where you are reading. You can also easily highlight passages and email them to friends and colleagues. Additionally, you have a broad range of ability to customize the look and feel of the text to your own liking. DocuApps also maximizes the page reading view with no ads or tools on the reading page. DocuApps is changing the way we read, research and share useful and important documents. 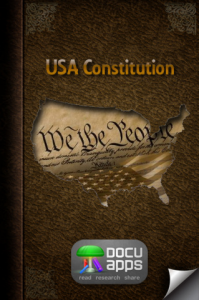 Our first two DocuApps, now available on the iTunes App Store contain the full text of the Declaration of Independence and the USA Constitution.